Really cool!!! Excellent work, Martin. Oooooo! I love the reflection of the sky and clouds. Brautiful lighting with get dark tone which have a little bit of life in them. 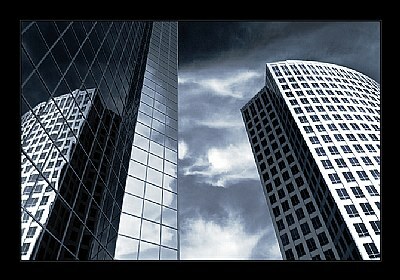 The composition of the buildings with the contrast of the sky really makes a perfect shot. Keep up the good work. Excellent Martin - a well deserved PoD.Great angle and composition, excellent tones. Excellent work,great contrasts and perfect reflections. perfect clear and great just a POD well deserved it! Fantastic tones, Martin. Excellent composition with the touch of the reflection. Perspective, reflection and tones for a Photo of the Day so well deserved. WOW! Great tones and sharpeness. Congrats on the Photo of the Day! Fantastic architectural shot!! Fabulous tones, great reflection(s), wonderful ominous sky that adds a lot of tention to this image... excellent composition... well captured!!! I like the drama in this photo - very powerful and even somewhat ominous. The way the dark patches in the clouds seem to blend in with the building is very subtle, and I think the anatgonistic placement of the two skyscrapers only adds to the tension. The reflection is the finishing touch, very well captured! Excellent capture Martin - the shapes of the buildings combined with the darker tones add a nice urban feel to this photo. Perfect composition and the clouds between the buildings are an added bonus. Very well seen and captured.